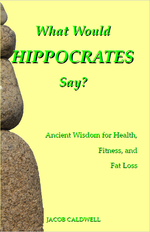 This book follows the desire for health and balance, asking "What would Hippocrates say?" if we were to ask this most ancient of physicians, the Father of Medicine, what he would suggest we here in the modern world do to stay healthy. Using the tools of exercise, massage, bathing, eating, sleep, and herbs, this book explores the 2,500 year old tradition of Western health practices, demonstrating basic regimens that we can all follow to live healthier, more balanced lives. This book takes the reader step-by-step through the simple process of assessing one's imbalances and creating a balancing diet and exercise regimen. Read an excerpt here. (Available at www.amazon.com). This book follows the desire for suppleness to its depths. It is a practical guide to working with the body instead of against it, teaching how to take care of the body on a daily basis with gentle movements and postures. This book gives us all a new way to imagine how we can tend to our bodies. The basic idea of this book is to pay attention to the body: to stop ignoring it, and to stop treating it like a malfunctioning machine when it is hurt and injured. The practice of Tending the Body revitalizes the body by bringing it back to our attention. It reads the body poetically, hearing its aches and pains as part of the larger story of our lives. Read an excerpt here. (Available at www.amazon.com). This book is an attempt to revitalize our bodies by reimagining eating and exercising. The primary aim of this book is to help us all to focus on vitality instead of fitness. The pursuit of fitness or the lack thereof is what leads so many people in to my practice. Many people injure themselves by exercising too aggressively in their pursuit of fitness. Many others are so unconsciously disgusted by the blind, zombie-like approach to exercise that they refuse to exercise enough to keep their bodies healthy. Both of these extremes are the result of a lack of imagination about exercise itself. This book gives us all a new way to imagine exercise (among many other things) so that it becomes what we desire to do, instead of something we either compulsively perform or lazily reject. Read an excerpt here. (Available at www.amazon.com). This book is a collection of some of the greatest poems by some of the greatest poets of all time (Wordsworth, Dickinson, Yeats, Whitman, Blake). I put this collection together because we all need to imagine the world and our bodies with a lot more poetry. We take things way too literally. We imagine the body as just a machine, instead of as a living animal. The poems in this collection are so powerful that they force us to reimagine the world, and in so doing they breathe new life into our bodies. I say in this book that "The body must be read both literally and poetically if there is to be real therapy for the body." I collected these poems to help us all imagine our bodies with more poetry. Read an excerpt here. (Available at www.amazon.com).